But first, let me just say that there is a lot to really like about this film. I felt that it was the perfect snapshot of modern society, and by “modern,” I literally mean right now, as in March of 2010. Whether is was paid product placement or not, you felt a real sense of authenticity in the setting because all of the characters were using actual products we use today, such as the iPhone and the Nintendo DSi. Not some generic electronics or obvious brand parodies, they were actually the iPhone and DSi. I believe the message Hosoda was conveying in doing this was that even though this anime film is a pure sci-fi action flick, we are actually living in a world that is filled with this amazing technology. The characters are constantly whipping out their cell phones to check their messages and log into the virtual community, which shows this incredible connection everyone had to each other over this kind of network. And sure enough, as soon as the movie ended and the house lights went on, I looked around the theater to see almost everyone around me checking their cell phones. This film was a true reflection of the world we’re living in right now. 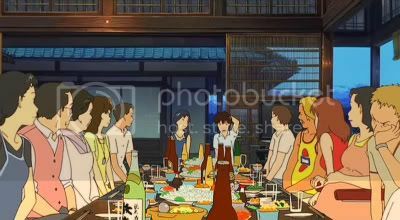 I also really liked the way Hosoda paused the movie several times for moments of awkward silences. In a medium where a new action is happening every few seconds, Summer War essentially stops dead in its tracks and waits an excruciating number of beat before anyone moves or says anything. This is such an unconventional move in anime, and I don’t think I’ve seen it pulled off since the latter episodes of Evangelion. So much respect to the man for trying out a stunt like that. But ultimately, my problem with the film is that the main plot felt very uneven. There is essentially two faces to Summer Wars, the real world involving a huge family gathering and the virtual world being overtaking by a hacker. The problem is that 99% of the film takes place in the real world and focuses on the family and their relationships, but all of the major conflicts in the plot arise from the hacker story. Because we spend so little time dealing with the virtual world, it becomes more of an after thought that never really gets fleshed out or becomes a huge consern for the audience. But then a very tragic event within the family in the real world is blame on the problems in the virtual world, and suddenly all attention and focus is switched to this side story that has just been stewing idly in the background this whole time. This all leads to the climax of the film where suddenly every character jumps in with a brand new role to fulfill that hardly matches the part they’ve played up to that point. And one of the biggest heroes of this epic cyber battle ends up being a character that has had the smallest interactions to the online world up until that point. Again, trying not to give away any spoilers here, but I just felt the final act of the film did not match the story leading up to it. It felt really rushed and sloppy, and that most certainly took away the momentum that had been building up in this story about a family reunion. After the screening, I was asked which recent anime film did I like better, Oblivion Island or Summer Wars. The difference is that I went into Oblivion Island expecting it to be bad, and its climax absolutely blew me away. I went into Summer Wars expecting it to blow me away, and I walked out with an, “well, that was nice,” impression. Summer Wars is a step up from The Girl Who Leapt Through Time, which was also a really good film. However, Hosoda still has a bit to go before he can be rank among Miyazaki, Kon, or even Shinkai when it comes to great anime directors. I also read the first volume of Bunny Drop over the weekend, and this time, I can agree with the critics. I loved this comic, it’s fantastic. I can’t help but to compare it to the shojo comic Aishiteruze Baby, where a teenage boy is left in charge of his little female cousin and ends up becoming a surrogate father to her. Even though the comic was shojo, it ended up being the work where I based my “longing for fatherhood” definition of moé off of. Bunny Drop is a very similar premise, however, the difference this time is that this bachelor is a working professional 30-year-old. So rather than having the novelty of a teenage boy raising a little girl, it’s actually a man who is of proper age for fatherhood. This leads to a far more serious and realistic take on parenting, but its still just as sweet and adorable. As I was reading the manga, I thought to myself, “so, is this seinen or josei?” and I even came close to tweeting out the question online. But the more I thought about it, the more I realized that this had to have been a josei comic. And that’s just a damn shame considering that I, a professionally working 20-something bachelor, was feeling such a strong connection to this protagonist. If I was a Japanese manga reader, would I have even been able to read this or would it be too embarrassing to pick up a woman’s magazine? And again, I think that if you’re looking for a source on the moé phenomena, this is it. The “longing for fatherhood” goes against so many traditional gender roles, and comics touting the notion of men taking on maternal duties can only exists in comics for women. So we had to adapt the concept to be able to put this kind of stuff in our own magazines, and thus, we have moé. I also caught the Irish animated movie The Secret of Kells over the weekend. If you’re unfamiliar with Kells, it was the only nominee for this year’s Best Animated Film oscar that you have never heard of before. It has been touted for its unique visual style, and indeed, that alone is worth the price of admission. Is it an anime style? Not at all. In fact, it’s about as western as a cartoon can get. I had described it as a mashup of Kim Possible character designs with the creativeness of The Thief and the Cobbler. The latter title is probably a little too obscure for me to use for comparison, so I highly recommend checking out Wikipedia for full info on that film. But the influence is very obvious, and I was very happy to hear director Tomm Moore confirm this connection in his interview with Samurai Beat Radio last week. Story wise, it’s a children’s film, so don’t expect anything that deep or complex. But I think the pretty visuals more than makes up for that to the eye of an adult viewer. This entry was posted on Monday, March 15th, 2010 at 6:54 pm by Scott	. « The Daily Almanac: Protecting the Virtual Children!